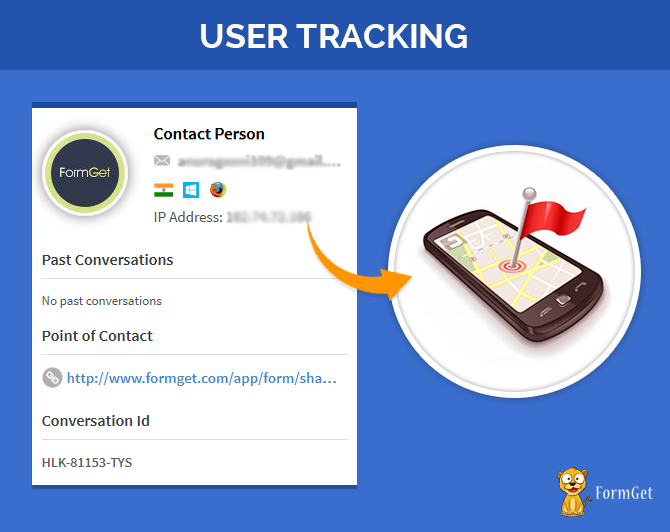 User Tracking, a feature of FormGet allows you to track user activity by which you can know who is using your product or service & from where. You will be able to track users IP Address from where the message has been submitted. You will be able to see the Country from where the user belongs to. You will be able to see the Web Browser that user has used while submitting the form. You will be able to track Devices whether a user is using a laptop, a desktop etc. for form filling. Tracking user activity allows you to draw different patterns about the client’s behavior so that you can enhance the business or sales of your organization. You can easily track your forms and optimize your marketing and lead capturing process in a better way using FormGet tracking formsanalytics extension. It will prevent you from facing any consequences if someone attempts to provide any wrong information to you.